Yes, whilst the British ponder a Brexit or the British exit from the European Community, the majority of Malaysians eagerly await "NEXIT," OR NAJIB EXIT. If anyone claims that Najib son of Tun Razak has the support of the majority of the Malaysians he has to think again and actually he can go tell that to the goats. At the last elections it was abundantly clear that Najib was the first Prime Minister in Malaysia to lose the popular vote that means more Malaysians voted for the opposition than for this son of Tun Razak. claimed the office of the Prime Minister, the only man in the history of the nation whom the majority of Malaysians did not want as their Prime Minister and yet he claims that the majority of Malaysians elected him. If a referendum was carried out today the great majority of Malaysian will reject Najib Razak for the position of Prime Minister and he knows that only too well, but he'll never admit it though. So why is Najib Razak still hanging on to the position of PM and refusing to come in the clear about his alleged involvement in the 1MDB, the RM2.6 Billion which has now gone up to RM4.0 billion, the KWAP, the Scorpene, scandals not to mention the alleged involvement in the Altantuya Sharibu murder case, and further allegations made against him by PI Bala who conveniently died of a heart attack, the sacking of the Attorney General Gani Patel in what is alleged to have been a case to prevent him from issuing a warrant of arrest on the PM, the sacking of his deputy for inquiring on the 1MDB and the constant refusal to come out in the open and be questioned on these allegations. Najib does not face the press on these issues instead his protectors arrest and detain journalist who ask him questions pertaining to these issues. Najib Razak does not even stand up to answer these questions and be questioned in Parliament about these issues, he leaves it to Ministers in his department and he has a whole bunch of clowns there who will say and do about just anything to defend him and we have seen a lot of that, often contradicting each other, so what on earth is wrong with this man we call Najib Razak. In one breath he comes out full of fire saying he'll sue WSJ and the whole of Malaysia got excited about it for many reasons though and as expected by the great majority he chiceened out and has now refused to sue the journal, if he was really innocent of all that has been alleged agaisnt him then he stands a great chance to sue the Wall Street Journal for billions in fact being a PM may be Billions for bringing his name to disrepute so why hasn't Najib son of Razak not done so? The questions have put the country in bad light nationally and internationally, we are now seen as just not a corrupt nation but a very corrupted nation, in fact what is happening now even puts UMNO in the shade of an organization corrupted to the core and Najib claims the majority in UMNO support him, and yet this majority is not asking him to hold himself accountable and come out and answer each and every accusation made against their leader who is the PM of the country. What woudl happen if Najib decides to exit? 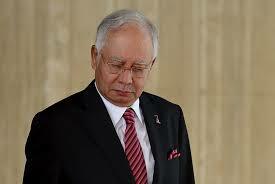 Well of course the successor wil ahve no alternative but to investigate every allegation made out against Najib and if foudn guilty he will ahve to face the full brunt of the law there can be no two ways about it, and is that the reason Najib has to cling on to power for dear life and literally so? "NEXIT" OR "NAJIB EXIT" IF SUCCESSFUL WILL HELP US RESOLVE THESE QUESTIONS ABOUT ALL THESE ALLEGATIONS MADE AGAISNT NAJIB. WE MUST ADMIT THOUGH THAT WITH WHAT IS AVAI;ABLE IN THE PUBLIC DOMAIN AND THE CONTRADICTING EXCUSES GIVEN IN ALMOST ALL THE CASES MANY OF THESE SEEM NOT TO BE MERE ALLEGATIONS.